Microprocessor Dissolution Test Apparatus – 1918 & 1916 | Electronics India - Manufacturer, Supplier and Exporter of Analytical, Scientific Laboratory and Pharmaceautical Instruments in India. 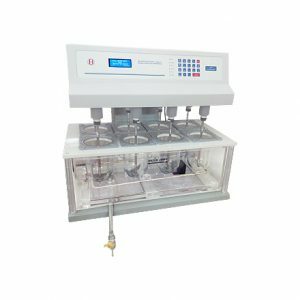 Microprocessor Dissolution Test Apparatus is a solid state instrument designed for the determination of active drug ingredient in any pharmaceutical formulation, tablet or capsule as per IP and USP specifications. This apparatus evaluates adequate bio-availability and provides necessary information to formulate in the development of therapeutically optimum dosage forms. The instrument is designed and manufactured for pharmaceutical industries. It is used in quality control and R & D to determine compliance with the dissolution requirement of the Tablet and Capsule as per USP/IP standards. System is equipped with 4 line alphanumeric LCD display with backlit and 19 soft touch membrane type keys that provides a convenient interface for entering the data. Independent stirrer and platform keys on the front panel allow the user to easily start/stop stirrer movement or displacement of platform in the required direction at any time. The instrument has the storage facility for 200 samples. The samples being analyzed are automatically stored in the memory in different batch and sample numbers. The system has three programming modes i.e. Routine, Sustain and Control mode. It has the facility for setting up 20 different test methods using Routine and Sustain modes which are retained in the memory even when the power is switched OFF. Provision has also been made for attachment of any dot matrix printer with centronics interface so that any of the stored setups/results can be printed. The unit is provided with dissolution vessel with cover, having necessary arrangement to hold temperature sensor and the same is placed in the sturdy, acrylic water bath. The large spread out stainless steel heater ensures perfectly uniform heating. The instrument has dual channel temperature system with sensors to monitor the test temperature of dissolution vessel as well as that of the water bath. The motorized platform’s (stirrer unit) up/down movement of the instrument improves the accessibility for sampling. Stirrer speed is accurately controlled and maintained at +1 rpm by microcontroller as per IP, USP specifications. The elapsed time for the current ongoing test is retained in the instruments memory. In case of power failure during the run mode, when the instrument is switched On again, the user has the option to run the test from the point of the power failure.